Yes, I know, it looks just like the Queen of Canada and the Queen of England etc., but she IS the Queen of Australia and a new portrait was unveiled on Friday by Governor-General Quentin Bryce in Canberra. You’ve seen a lot of photographs of the Queen but there would be very few like this one. This is her jubilee year and remarkably there has only been one official portrait this year and the privilege went to Australian born artist Ralph Heimans. Heimans’ portrait will hang in the National Portrait Gallery in Canberra until April next year. 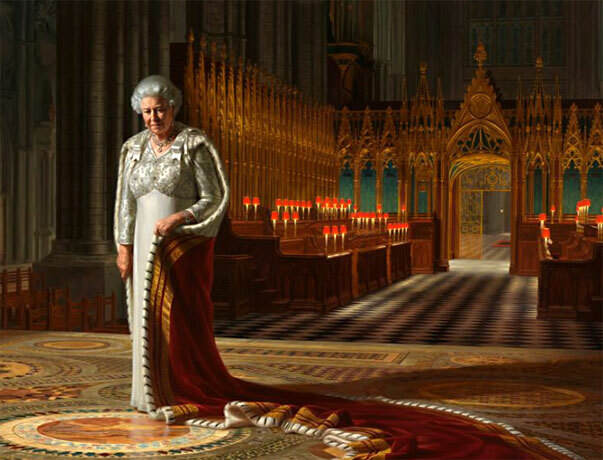 The portrait is set in Westminster Abbey where the Queen is dressed in full regalia, including her robes and jewels. What’s striking is the pose. The queen is looking down and it seems she’s contemplating something quite profound. I suspect it’s, “how can I die and leave the monarchy to Charles who wanted to be a tampon?” Perhaps not. I really like the portrait and Heimans has done an outstanding piece of work. He shows the Queen as we’re used to seeing her – rarely smiling. Still, she looks pretty snappy for 86, don’t you think? Next post: How Much Sleep Do You Get?